Brief Description: Two very similar broadleaf weeds with small, horn shaped purple flowers that grow on the top of long stems. They often grow together and look similar. 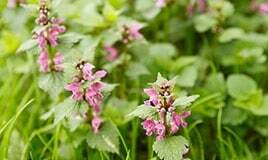 What are Henbit and Purple Deadnettle? Though they are technically different broadleaf weeds, both henbit deadnettle and purple deadnettle are in the same family and are often found growing together, taking advantage of similar environments. They are part of the mint family, and may have been brought to the United States as a food before spreading as a weed across lawns. Purple deadnettle leaves have stalks on the flower stems. Henbit leaves do not. Otherwise the two are similar in appearance. Leaves are spread out a centimeter or two and circle the stem like a skirt. 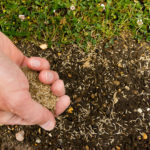 They are considered pretty enough to be a flower and are sometimes left alone in gardens, but if your lawn isn’t well maintained it can spread quickly and prevent a green lawn. As a winter annual, these broadleaf weeds tend to be a bit harder to control. They are easily controlled by pre-emergent herbicides, however, and can be controlled by mulch. As with all broadleaf weeds, dense and healthy turf with deep roots will often choke out both henbit and purple deadnettle. If your lawn is already struggling with either of these broadleaf weeds or you are hoping to use a pre-emergent herbicide on these and other invasive weeds, contact Green Lawn Fertilizing today. Find out more about our broadleaf weed control and how it can help you create a beautiful green lawn.